We believe Jesus makes a difference in every day lives. He breathes into us a genuine love for others, a deep sense of peace and joy, and a fresh reminder of His calling and purpose in our lives. We want to share this Hope with you. We are located at 101 Ritchie Road in Woodway, just off Highway 84 approximately 2.8 miles south of the Richland Mall (at the corner of Ritchie Road and the northbound access road of Highway 84). Where do I park and where do I go? When you arrive on our campus you will find a special section of parking spaces that have been reserved for our guests. 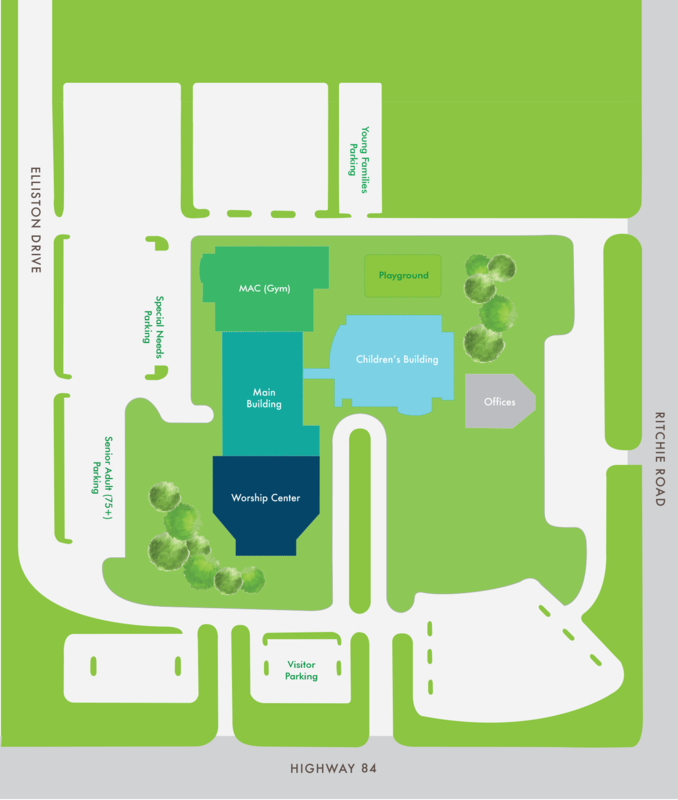 These spaces are located close to provide easy access to our entrances. If you have kids birth-6th grade, you can head straight to the Children’s Building where the Welcome Team will greet and assist you – just let them know you are visiting for the first time. If you are 7th grade – adult, please stop by the Welcome Center located by the Worship Center. We will find exactly where you belong and help you get there! When Are Sunday Morning Service Times? On Sunday mornings, you are welcome to attend Worship at 9:00 or 10:30 am, with Bible Study classes also being offered during each of these times. The 10:30 hour offers two worship services. The service in the Worship Center features a choir, praise band, and often an orchestra. The service in The Venue (the building located across the street from the church office, on Ritchie Road) is led by a worship band and features Paul Sands, our Senior Pastor, on video. Both services are casual and welcome you to come as you are. Dress comfortably. On a Sunday morning at First Woodway, you’ll find anything from jeans and t-shirts to business casual. We care more about meeting you than about what you’ll wear. Get in touch with Sarah Nelson, our Connection Coordinator. She would love to answer any questions you have and help you get connected. There’s a lot going on at First Woodway! Sarah can help you find a Sunday School class, provide more information about the activities and ministries, or give you a tour of the campus before your first visit.